Residents in MU’s Comparative Medicine Program organized and conducted a virtual 5K run to support Homes for Animal Heroes, a nationwide network that works with the research community to find loving, permanent homes for retired research animals that contributed to biomedical research. 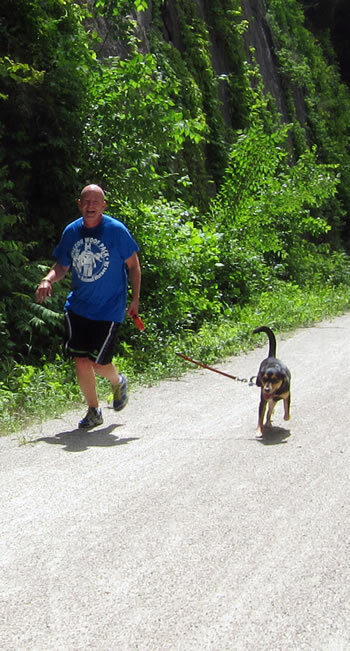 MU CVM Professor Craig Franklin, DVM, PhD, DACLAM, runs along the Katy Trail State Park as part of the Woof Pack, raising funds for Homes for Animal Heroes. A virtual 5k allows participation from virtually anywhere: a neighborhood, a local park, a beach, a track, or even a treadmill. Participants were encouraged to run, walk or jog with their pets, families, co-workers, or friends, and to raise money to support the rehoming effort. Mizzou Woof Pack supported the virtual 5K and decided to hold a formal event and run the 5K together on May 21 at the Katy Trail State Park Rocheport trailhead. Team members formed the Woof Pack in order to combine forces, raise more money and make a bigger difference together than they could as individuals. The team’s Run for Research Awareness fundraising Facebook page facilitated donations to Homes for Animal Heroes. Mizzou Woof Pack is currently the nation’s No. 2 fundraising team in the event. The Comparative Medicine Program trains students to advance human and animal health through animal medicine research. Students in the program may pursue either a master’s degree or PhD. The curriculum prepares graduates for careers including comparative medicine research, clinical and administrative laboratory animal medicine, or comparative and diagnostic laboratory animal pathology. The Homes for Animal Heroes network is directed and operated by the National Animal Interest Alliance, a broad-based animal welfare organization founded in 1991 and based in Portland, Oregon. The University of Missouri recently announced that it is partnering with Homes for Animal Heroes to expand its adoption program.